Mixed Reality Headsets Market size was over USD 2 billion and shipments were over 10 million units in 2016, the industry is predicted to grow at over 35% CAGR from 2017 to 2024. 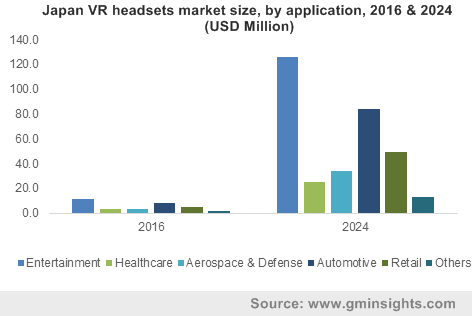 Growing penetration of VR and AR technologies across various applications such as automotive, gaming, healthcare, education, industrial; and retail is expected to drive the mixed reality headsets market growth over the forecast timespan. These devices are being rapidly adopted in retail, from apparel to home décor, to attract customers and increase brand loyalty. These devices allow retailers to immerse the customers in customized worlds. The mixed reality headsets market has brought new dimensions to the education sector by simplifying the process of learning and teaching. For instance, in 2015, Microsoft HoloLens introduced HoloAnatomy. The AR tech displays real-time anatomical models and is used to teach the human anatomy in a better way. Furthermore, the education and technology ministries in several countries are taking initiatives to leverage the capabilities of these devices. For instance, the French Ministry of National Education revised the national curriculum to include the use of these devices in the learning process. Lack of quality content is expected to challenge the mixed reality headsets market. To attract customers and gain a strong foothold in the industry, companies need to ensure that enough good quality content is available on the internet. Moreover, rising health concerns due to the prolonged use is expected to challenge the industry in the long term. Users may also experience eye strain since they need to focus on a pixelated screen with these near-to-eye devices. Evolution in the gaming industry and high demand for advanced devices has drastically increased the use of AR and VR devices in the mixed reality headsets market. Commercial use of VR devices is higher than the AR counterparts, due to low cost and wide usage of immersive devices in the gaming industry. These are being increasingly adopted in the movie theatres due to their ability to block distractions and ambient light, thus providing users enhanced experience. The augmented reality headsets market is very attractive, with Apple expected to release its AR offering around 2019. The segment is projected to grow at over 70% CAGR over the forecast timeline. Some of the media companies have developed applications that are compatible with mixed reality headsets. For instance, Netflix has developed a VR app that is compatible with the Samsung Gear devices and shows content in 720p HD resolutions. HMDs is expected to grow significantly over the next seven years in the mixed reality headsets market, owing to the presence of large number of manufacturers. Easy availability of raw materials and software required to manufacture these devices is expected to bode well for the industry growth. High demand for HMDs is expected from the aerospace & defense sector. These devices are being used for training and simulation in manufacturing and flying aircrafts. In December 2015, NASA announced that the astronauts will use the Microsoft HoloLens as a real-time instruction manual. The project called Project Sidekick is undertaken to facilitate closer communication between ground control and the astronauts in space. Healthcare applications in the mixed reality headsets market are growing significantly, owing to enhanced capabilities of these devices in diagnostic and therapy segments. Many small players in the industry are investing to develop new products to cater to the requirements from the healthcare sector. For instance, in September 2017, a U.S.-based startup, NuEyes announced the development of smart glasses for the people with impaired vision. The battle to capture the three trillion-dollar healthcare industry has started with the tech-giants such as Apple and Google acquiring healthcare technology companies to develop smart glasses for diagnosis. At the World Economic Forum in January 2017 in Davos, Bill McDermott, SAP CEO emphasized that personalized medicine using technology will be the future of the healthcare industry and that the industry will move from an analog experience to digital, thus propelling the mixed reality headsets market growth. The U.S. mixed reality headsets market is expected to witness high demand and grow faster than the global average, owing to the rising demand from the aerospace & defense industry in the region. The U.S. military is investing on projects related to these devices to improve efficiency and situational awareness of the ground troops. In May 2017, the Army Research Lab (ARL) and the Army's Communications Electronics Research, Development and Engineering Center (CERDEC) unveiled the prototype of the Tactical Augmented Reality devices, that will enhance soldier’s ability to maneuver the battlefield. 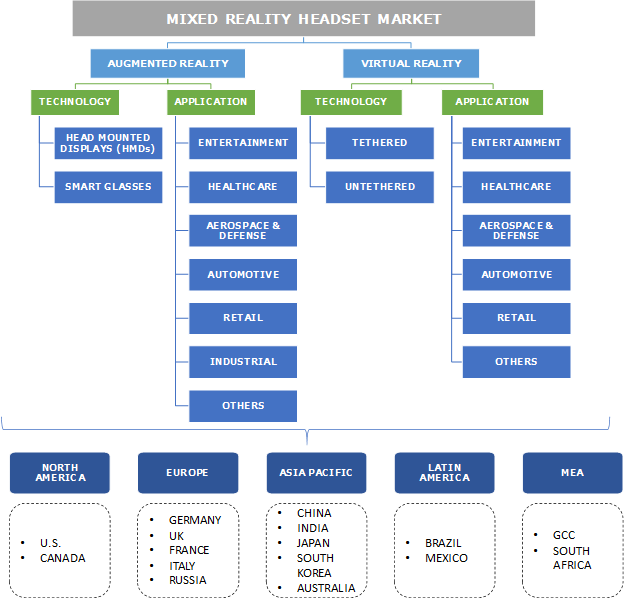 The Mixed reality headsets market is characterized by a large number of players, majority of which are located in the U.S. and the customers being early adopters of technology. These factors are expected to impact the U.S. industry positively. The Europe mixed reality headsets market is expected to gain momentum over the forecast timespan, owing to increasing popularity in the entertainment industry. These devices are being increasingly used in theatres, museums, and tourist destinations. For instance, to attract customers after the November 2015 terrorist attacks in France, the theatres in Paris are using smart glasses. Some of the vendors in the mixed reality headsets market include Oculus/Facebook, Dell, HP, Acer, Google, Microsoft, Magic Leap, Sony, Samsung, and HTC. One of the major strategies adopted by the leading players is the acquisition of small players, to gain substantial market share and combat the competition. For instance, in 2014, Facebook completed the acquisition of Oculus, a virtual reality company. With the acquisition, Facebook entered the VR industry. In May 2017, Google, Inc. announced its partnership with HTC, Lenovo, and Qualcomm to launch a series of VR headsets with new set of features. These devices will have position tracking to track the position of the device relative to the environment. Such innovations are expected to attract customers and augment the mixed reality headsets market growth. The video consumption explosion and the innovative ways that people use to view content has resulted in an exponential growth of internet traffic. The technology has caused disruption in content consumption. Early attempts at VR headset development failed, with the launch of Virtual Boy headset by Nintendo. The devices were discontinued in a year, owing to a continuous inflow of customer complaints. However, despite this, many companies invested in new product development, in light of the vast market potential, thus aiding the mixed reality headsets market growth. Companies are massively investing in R&D to provide distinguished solutions to maximize their share. For instance, Lumus Ltd., AR display maker, has raised over USD 90 million in R&D funding, a portion of which is contributed by HTC.